We’re returning to an old favorite this week with the cheerful theatrics of three musical robots: Steam Powered Giraffe. Incidentally, another old favorite (guest Nelson Lugo), is returning to us! 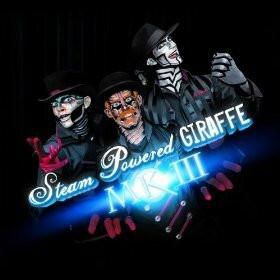 For review, he delivers us Steam Powered Giraffe’s third studio release, MK III. (To hear our review of their second album, see Ep. #39!) And stick around, because after this fun-filled excursion through the band’s most daring product yet, we get to hear all about Nelson’s excursions through the world of magic and theater, namely his upcoming show, “Gathering the Magic.” Enjoy! 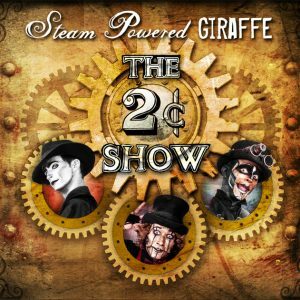 This week is full of throwbacks and smokestacks as we get down to the brassiest of tacks with the steampunk stylings of Steam Powered Giraffe, and their latest full-length, The 2¢ Show. Then we talk a little about music’s therapeutic capabilities, while gauging the polar extremes of musical receptivity.